– How to store: wrap in damp cloth and plastic bag, then refrigerate. Alternatively, bundle spears with rubber band and place upright in container with an inch of water. ROOT CELLAR CARROTS (Chantenay): shorter than other cultivars, but have greater girth with broad shoulders and taper towards a blunt, rounded tip; most commonly diced for use in canned or prepared foods. These carrots have been stored for the winter, so some may have spots to cut off, but are still good to use, but every once in awhile, a rubbery or mushy carrot will have escaped our crew’s watchful eye. Please feel free to make soup stock or compost out of the carrots that are considered “ugly” or “unfit”. –Lemon Balm – these fragrant lemon-minty leaves make a delicate herbal tea, served hot or cold; good addition to lettuce or fruit salads and ice cream; nicely paired with grilled fish or lamb and tossed with steamed vegetables; also aids in depression, tension, or nausea. –Winter Savory – is a semi-evergreen, perennial herb; its strong spicy flavor goes well with beans and meat; medicinally it has antiseptic, aromatic, carminative, and digestive benefits, as well as relieves bee stings; fresh savory has a strong spicy-peppery flavor and resinous odor similar to fresh thyme; prior to widespread European use of long pepper and black pepper, savory filled a similar role in European cuisine. –Tarragon – its flavor is delicate and almost licorice or anise-like; an essential herb in French cuisine; exceptional in egg dishes, poached fish, chicken, mushrooms, salad dressings and with other vegetables. –Oregano – This member of the mint family is similar to marjoram, but not as sweet and more pungent, spicy flavor and aroma; good in soups and tomato-based dishes; good as a tea for indigestion and excellent chewed up and applied for relief with bee stings. RED SCALLIONS: young shoots of red onions with long green stalks and milder tasting than large bulb onions; full of great fiber and antioxidants, high in potassium and source of vitamins C and B-6. -How to use: the bulb, flowers, and green leaves are edible; can be cooked, grilled, roasted whole as a vegetable; chopped in salads, soups, and other dishes for flavor. -How to store: refrigerate in damp towel/plastic bag for 2-5 days. ROOT CELLAR POTATOES (Mountain Rose): rosy-skinned inside and out, these versatile, all-purpose spuds are deliciously moist, but not waxy textured; extra nutritious, and high in antioxidants; excellent baked, mashed or fried. You will receive these “old buddies” potatoes that have been over-wintered in our timber frame root cellar; possibly slightly less firm than a new potato, but good for cooking in any way suggested below. -How to store: keep unwashed in cool, dark place in paper bag; ideal temperature is 38-40 degrees with 80-90 percent humidity; a basement or the refrigerator will work with storage potatoes. RADISHES: You will receive Easter Egg Radish (a beautiful mix of red, purple, pink, and white round radishes; crisp and mild flavor). WHITE HAKUREI TURNIPS and GREENS: You will receive a large bunch of white salad turnips with round, smooth roots that have a sweet, fruity flavor with a crisp, tender texture. Both roots (good source of Vitamin C, potassium, and calcium) and greens (slightly sweet and excellent source of vitamins A and C and good source of riboflavin, calcium and iron) are edible! 1. RUSSIAN SUMMER HOUSE FEAST – COOKING CLASS on June 21 from 6-8:30 PM: UM professors and CSA members, Alina and Michael Makin, will facilitate ways to use your early summer produce as a typical meal at the “Russian Summer-House”, which Alina remembers from her early years. Based on the culinary heritage of her native Russia, but making ample use of other culinary traditions, Alina’s meal will showcase the Tantré share with savory and sweet dishes that we will turn into a delectable meal by the end of the night. Please register by email with your NAME, EMAIL ADDRESS, and PHONE NUMBER. A small fee of $5 will help pay for any materials and extra ingredients. 2. 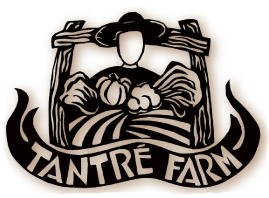 FAMILY FARM HIKE on June 22: Come join us for a guided monthly exploratory walk around Tantre Farm on Friday, June 22, at 4 PM. We’ll use all our senses as we take an approx. 45 minute hike with CSA member, Sheila Schueller and her daughter, Renia. You will explore the farm’s fields, wetlands, and forest. Sheila has taught ecology and field biology classes at Eastern Michigan University and the University of Michigan. Meet by the picnic tables in the backyard at 4 PM. No RSVP necessary, but if you email that you plan to attend, then we know to wait for you. 3. CHANGING PICK UP DAYS: Please remember to contact us preferably a week in advance, but at least by Saturday of each week, to make changes in pick up days or locations. It is very disappointing to put together a box that is never picked up. Please have the courtesy to make some kind of contact with us, if you can not pick up your box for some reason. 4. PAYMENTS DUE: If you still owe money, you will see it in the Balance Due column on the Pick up Sheet. Please let us know if you think there is a mistake. Please finalize payments as soon as possible during the month of June. Argus-Packard (Sat) (limited site)–10 A.M. To 12 P.M. Break off woody ends of asparagus, blanch quickly and puree. Then add the rest of the ingredients to the pureed asparagus and puree the whole thing. Can be served on crackers, bread, or with vegetables. Mix first 7 ingredients together, and then slowly blend in the oil. Mix well before serving. This is delicious on salads, especially fish or chicken salads. You can also marinate chicken or fish piece in this mixture before cooking. After cooking, serve the vinaigrette as a sauce. Serve as side dish or main meal for one person. In saute pan, heat oil on high heat. Add turmeric, mustard seeds, chili powder, coriander powder, salt. Stir over med-high heat for 2-3 min. Add turnips (root) and coat well with oil/spice mixture. Cook over med-high heat for a couple of minutes. Add garlic scapes and greens. Continue to cook on med-high heat for a couple of minutes. Turn heat down to low and cover for 5 minutes. Cook until desired consistency for turnips is achieved (some like crunch, some like soft).